The MESA 3X20 is a high I/O density external PCIE FPGA card. The 3X20 has 144 user I/O available on a tiny 2.5" x 3.25" card. The 3X20 connects to the host via a standard 1 lane PCIE cable or through its motherboard connector. All core and I/O power is regulated on card so only single external 3.3V power supply is required. I/O pins are divided into three banks with 48 I/O each. One bank has fixed 3.3V I/O, while the other 2 banks can select between 1.5V, 1.8V. 2.5V or 3.3V VIO on a per bank basis. 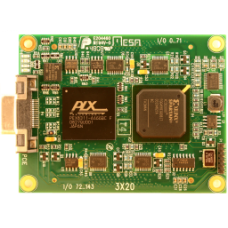 The 3X20 uses a 1M, 1.5M or 2M gate Spartan3 FPGA. 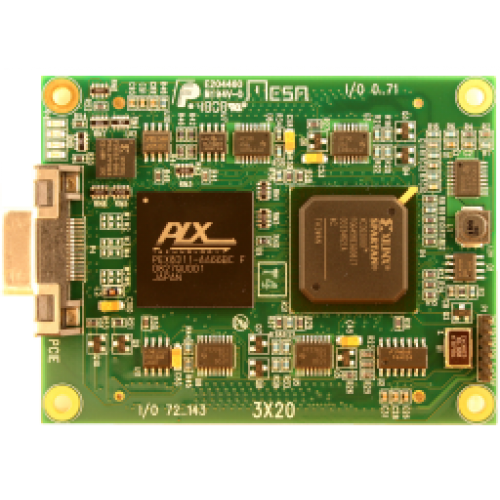 The FPGA interfaces to PCIE via a PLX PCIE bridge. The PCIE bridge allows FPGA programming via the host and does not require any FPGA bootstrap, insuring recoverability. The PCIE bridge supports host data transfer rates of greater than 150 MB/sec. On card configuration storage is provided for stand-alone applications or where the 3X20 must emulate a specific PCI device at power up. The PCIE connection can be from the on card one lane cable connector or through daughtercard connector pins (-MB option). Cabled host interface cards are available for both PCI and PCIE hosts (the 5I71 and 6I71). Express card cabled PCIE adapters offered by other vendors allow the 3X20 to connect to laptop computers. 96 of the 144 I/O pins support differential signaling. All I/O and power are connected to the motherboard via two high speed board-board connectors. The I/O connector pinout is reversable, allowing PCIE cable exit options. Two simple breakout motherboard cards, the 6I68 (for 1 lane PCIE slot PC Motherboard use) and 7I68 (for external cabled use), are available for use with the 3X20.